Before I write about more recent events I’d like to go back and cover a couple of happenings from earlier this year. 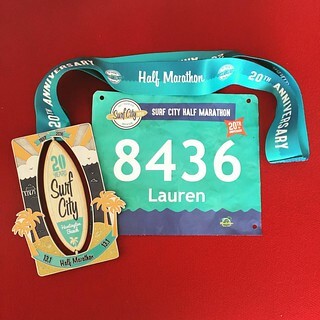 I can’t believe it’s been nearly a month since the 2017 Surf City Half Marathon, which took place on February 5th. That Sunday morning was perfect running weather, cloudy and cool, but unfortunately my running form wasn’t quite as perfect. 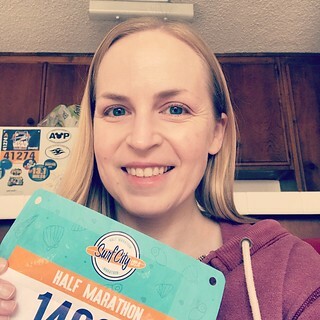 I was still recovering from my lovely cold/flu/bronchitis combination so my breathing wasn’t what it should be to run 13.1 miles, and my training had fallen off sharply for that reason. But I needed to restart my fitness regimen somehow, and I was feeling much better than even a week earlier, so I arrived for the half marathon with cautious optimism. Before the race started I chatted with a friend about our time goals (I just wanted to finish!) and took a picture with my running group. I was nervous, but ready to get started. And the first few miles of the course were great. I even passed my friend who is usually a lot faster than me around mile 4. That was a surprise. (In her defense, she’d been fighting her own illnesses throughout January as well.) 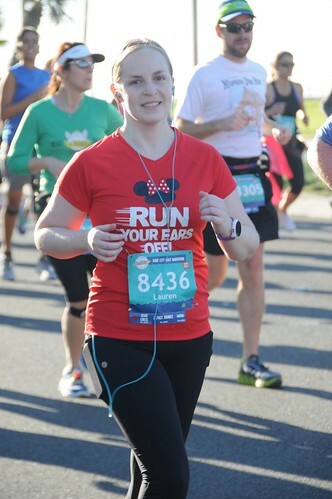 Training for the Disney World Marathon had gotten my body into pretty good shape, and I hadn’t lost all that much in the way of fitness in the month that followed. I did remarkably well for a number of miles, but by mile 10 I was gasping for breath. No surprise after having bronchitis, really. My pace wasn’t suffering too much, but trying to recover during my walk breaks was a losing battle. I passed my running group’s cheer squad and told them I was ok, but couldn’t breathe. The other runners around me overheard and thought I was trying to be funny. They all laughed, but I was being serious! With only about a 5K to go I pushed myself to finish without slowing down. And I did! My official time for the half marathon was 2:37:46 which wasn’t bad, but wasn’t great either. Not that I’d been expecting much. I was happy to have averaged a 12 min/mile pace for the whole distance. After getting my medal I grabbed a carton of chocolate milk that I’d been looking forward to all morning, and chatted with a couple of friends at the finish line before driving home. Even though it wasn’t my best half marathon showing I was still encouraged. I knew I was only going to get faster and stronger with renewed health and consistent running in the weeks to come. And with the LA Marathon fast approaching I needed all the help I could get. I haven’t written anything since Thursday, and now it’s Sunday night and I desperately need to go to sleep if I want to get any sleep before work tomorrow. The last three days have been a blur, to say the least. Not only did I run the Surf City half marathon this morning, but I had to work both days this weekend. It wasn’t pleasant, but I got a lot done. This week isn’t going to be any more relaxing either. If I’m lucky I’ll be able to take a day off due to all of the extra hours I worked this weekend, but that may not be possible. There are just so many obligations! I’m insanely behind on basic chores like cooking and laundry that I don’t know when I’ll be able to catch up. Right now I’m going to publish this sorry excuse for a webpage post and tackle a little housework before I go to bed. Maybe tomorrow I’ll have time to write something worthwhile. Doubtful, but I still have hope! 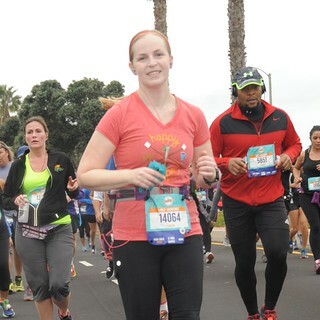 I was so excited to run the Surf City half marathon again, but this time without an injury. This race last year was by far my slowest half marathon and the least enjoyable one I’ve ever run. Luckily after a month of rest things started to improve. My IT band still bugs me occasionally, but not enough to prevent me from running. Thank goodness! So the 2016 Surf City half marathon was my chance for redemption. Despite two great half marathons in January, today didn’t go quite the way I hoped. It started out well, though. Last year I discovered that parking for this race can be a fiasco so I tried a different strategy this time around. I arrived earlier and parked in a more remote lot, right next to a shuttle stop. Stress free parking! The problems started when I walked over to catch the shuttle. At some point between my car and the bus I dropped my timing chip that was supposed to be attached to my shoe. I was going to put it in its proper place after I adjusted my laces at the start line, but the timing chip made a bid for freedom before then. This was problematic for a number of reasons. Not only would I not get an official finish time, but I wouldn’t get credit for completing the race at all. This wouldn’t be a big deal if not for the Beach Cities Challenge (Surf City + Orange County + Long Beach). I haven’t decided whether I want to run all three of the races this year, but my initial thought is that I want to try. (The OC half is the only one that’s really up in the air right now because I already have two other half marathons in May. I’m still considering whether I’m crazy enough to add a third.) But if I want a chance to earn the new sand dollar Beach Cities Challenge medal I need to get credit for the Surf City half marathon. But that was a situation I would address after crossing the finish line. The next problem of the day was the weather. We’re having a little heat wave in Los Angeles right now. It’s not nearly as bad as the scorching summer that was had last year, but warm and sunny are not the ideal conditions for long distance running. And the fact that the half marathon didn’t start until almost 8 AM didn’t help. Despite a little bit of a cool breeze off the Pacific, the whole race was really uncomfortable. After the first two miles I was rethinking my wardrobe. Shorts and a tank top would have been a better choice than the capris and short-sleeve shirt that I chose. I’m not sure if these unfavorable circumstances themselves caused my poor performance today or whether it was a combination of factors, but I was exhausted by the second mile. My body just didn’t cooperate today so there was a lot of walking involved in this “run.” I was so glad to make it to the finish line! It wasn’t my slowest half marathon, but it was close. Luckily my only goal for the race was to finish it, so in that sense I was completely successful. (The focus of 2016 is going to be distance rather than speed. This will become apparent when I start marathon training in the fall.) After collecting my medal (which is gigantic this year for the 20th anniversary) I headed over to the expo tents to figure out what to do about my errant timing chip. I ended up telling my admittedly ridiculous story to a race administrator who then took down all of my information for further review. Hopefully she will be able to verify that I did indeed complete the race today so I can get credit for it. That would make all of the discomfort worthwhile. Beach Cities Challenge 2016, here I come! Hopefully.